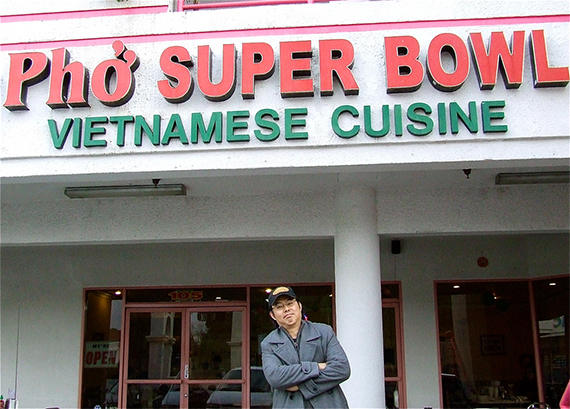 Eddie Lin with Good Food KCRW 89.9FM (KCRW.com) dropped by Pho Super Bowl: Vietnamese Cuisine in Alhambra, California to take on the Pho Super Bowl Challenge. His goal? Whether it be a free meal or a check mark on his bucket list we will never know, but one thing’s for sure, we was prepared to devour an insane amount of Vietnamese Pho noodle soup to feed a family. The entire team was out here to document the entire journey from start to finish. 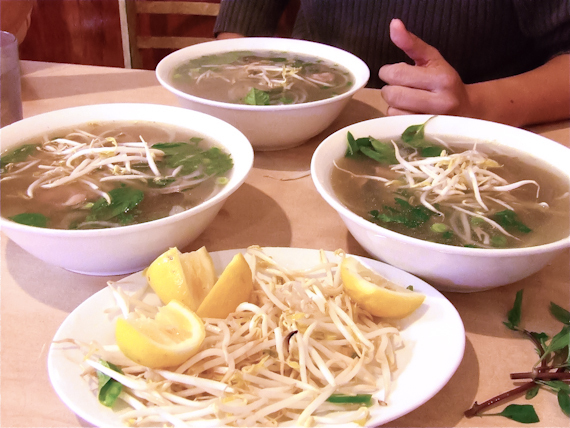 In order to complete the Pho Superbowl Challenge, “Eat 3 Big Super Bowls of Pho by yourself in one hour and get your meal for FREE. Must finish all the soup…” and Eddie was about to do just that. To read more about the story, check out Good Food KCRW and Eddie Lin’s Deep End Dining Blog. If you think you can handle the Pho Super Bowl Challenge, let us know and we’ll fix you up! Pho has particularly popular on the West Coast but also in any city and the United States, particularly on the East and West Coast; it was brought by Vietnamese refugees who settled in North America from the late 1970s onwards. Try our homemade version of Vietnamese Iced Coffee at Pho Super Bowl. Ca phe sua da or cafe sua da (Vietnamese: cà phê sữa đá) is a unique Vietnamese coffee that means “milk coffee with ice”. Ca phe sua da can be made simply by mixing freshly drip brewed black coffee with about a quarter sweetened condensed milk on ice. Ca phe sua da or cafe sua da (Vietnamese: cà phê sữa đá) is a unique Vietnamese coffee recipe. Literally, the name means “milk coffee with ice”. In northern Vietnam, it is also called ca phe nau da (Vietnamese: cà phê nâu đá), meaning “iced brown coffee”. Ca phe sua da can be made simply by mixing brewed black coffee with about a quarter to a half as much sweetened condensed milk and then pouring it over ice. Pho Super Bowl now has 68 reviews and 4 shiny stars on Yelp.com because of you Yelpers out there. 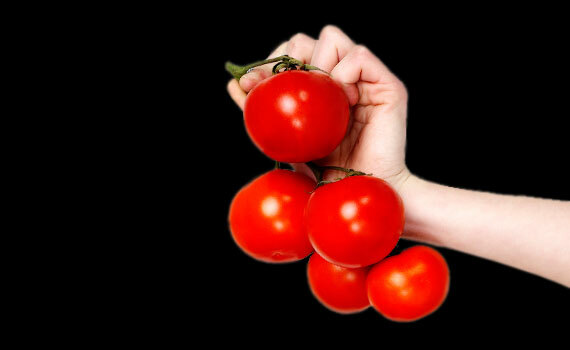 We just wanted to thank you for your continued support and welcome you any time to our restaurant. Let us know if you’re a Yelper the next time you drop by for some Vietnamese food. We look forward to meeting you in the near future. Chuc Mung Nam Moi! Happy New Year – Year of the Tiger! Official date February 14, 2010. May you have a happy, healthy and prosperous new year. !